I perpetually crave Chinese food. Or to be more accurate, Americanized Chinese food. I’m sure it has something to do with my huge salt tooth, which is totally justified because I sweat so much when I workout, right? I mean I don’t want to put myself in danger of developing hyponatremia. I’m really just looking out for my health, I promise. Or at least that’s what I tell myself when I eat half a bag of chips all in one sitting. All rationalization aside, the good news is when you make your own Chinese food you control the sodium (as well as other fun add-ins like MSG) and also can opt for healthier cooking methods like baking instead of frying. Because you never know when an egg roll craving will strike, I like to make a double batch and freeze some for easy reheating later. Every time I bite through one of these crunchy shells it’s like heaven in my mouth. I hope you feel the same way. Heat a large skillet with a small amount of oil in it. Add ground pork to the pan and sprinkle with the garlic, ginger, oyster sauce, and pepper. As you cook the meat try to evenly incorporate the seasonings. Once the meat is browned, add cabbage, carrots, bean sprouts, and green onions. Stir until just incorporated then remove from heat. (Cooking it longer will make the vegetables less crisp.) Let sit until it has cooled enough that you can touch the mixture. The heat from the meat will cook the veggies a little bit more. Fry or bake. 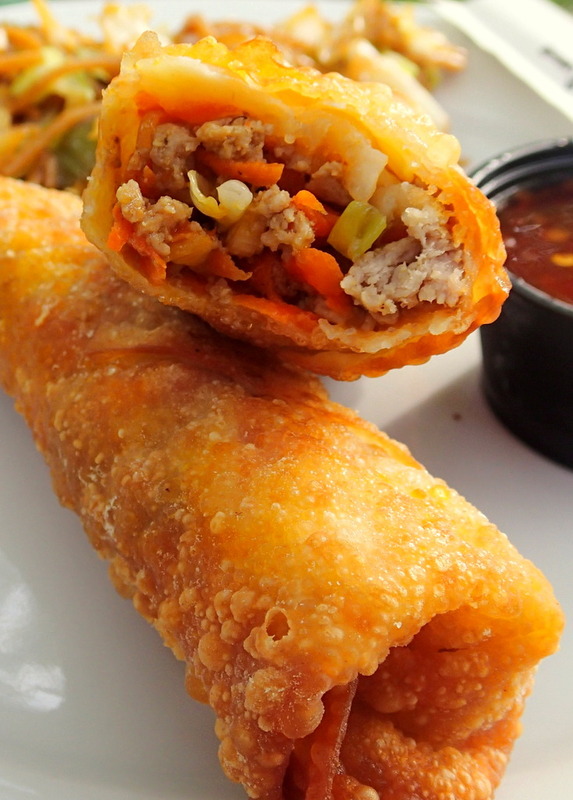 If baking, brush the egg rolls with oil and cook at 425° for 20-25 minutes. These egg rolls were fried in a skillet with about 1″ of oil and turned after one minute for even cooking. After frying, cool on paper towels to soak up extra oil. *Some stores don’t sell bean sprouts anymore because they feel it’s a risk, but I’ve always been able to find them at Whole Foods. Rinsing the bean sprouts as well as cooking them greatly reduces your chance of getting a food borne illness. I’ve been making egg rolls with sprouts for close to eight years and never contracted any type of food poisoning. Hey!! Looks delish. Two questions – 1.) I’m assuming ground pork, right? and do I freeze before or after baking them? Oh and the side salad looks delish too. What’s the name of that one? Yes, ground pork. I just updated the recipe so it says that. Thanks for pointing out my omission! I freeze them after baking them. Then when I want more I just reheat in the oven for 10 minutes or so. They get slightly soggy being frozen so this helps them crisp back up. I hope you like them as much as I do! The side dish is a knock-off of Panda Express Chow Mein. I base it off the recipe I’ve linked to. I’ll have to share my twist on it in a future post! Made em tonight- baked them and substituted zucchini from our garden instead of bean sprouts. My husband and I loved them!! You’re genius! Great idea to use zucchini, especially this time of year!